America’s oldest lighthouse (above) stands in Boston Harbor. The first tower, built in 1716, was destroyed during the Revolutionary War. The lower 75 feet of the present lighthouse was constructed in 1783 and another 14 feet were added in 1859. In addition to its 18,000,000 candlepower lens, the light station also has an enormous bell to warn ships off the hazardous shores on foggy days. But despite the velocity of the bell, it cannot penetrate what mariners call the “Ghost Walk,” an area of sea, several miles east of Boston Light. No one has ever been able to explain the Ghost Walk, not even a team of MIT students who spent an entire summer on Little Brewster Island studying the mystery. Minot’s Ledge Lighthouse. The Quonahassitis Indians believed Hobomock, a demon-like spirit, inhabited the menacing ledge of granite that lies about a mile off Cohasset, Mass. These jagged monstrosities that bare their teeth at low tied have gnashed holes in the hulls of numerous ships, sending many men to a watery grave. As the toll of lost ships and men increased, it became evident a lighthouse was needed at Minot's Ledge. It took three years to construct the original “screwpile” light which stood high above the water on metal “legs,” which Henry David Thoreau likened to “. . . the ovum of a sea monster floating on the waves.” From the day it began operation, January 1, 1850, keepers complained the structure was unsafe, but their warnings were ignored. The light had been in service a little more than a year when on the morning of April 11, 1851, the keeper went ashore, leaving his two assistants, Joseph Wilson and Joseph Antoine, in charge. A severe northeast gale moved in and the keeper was unable to return to his post. By the night of April 16, people on the mainland were awakened by the incessant ringing of the fog bell at Minot’s Ledge. The following morning, the lighthouse was gone. Hobomock’s lair had claimed another victim. The bodies of the two assistants washed ashore, one on Gull Rock Island in Cohasset Harbor, and the other in Nantucket. There was some disagreement concerning the ringing of the fog bell as the lighthouse was destroyed. The more logical dismissed it as the result of powerful waves striking the bell. The romantics claimed it was Wilson and Antoine, bidding their family and friends a final farewell. Construction of the current 97-foot, grey granite tower began in 1855 and the present Minot’s Ledge Light became operational in November 1860. The first keeper of the new light lasted only a year and it wasn’t long before the Lighthouse Service had difficulty filling the post. The assignment was undesirable for several reasons: Monstrous waves crashed over the very top of the lighthouse, doors were frozen shut during winter storms and the isolation affected the most stalwart of men. One assistant keeper was driven mad from living in rooms without corners, another threatened to kill the head keeper, and to make bad matters worse, there were spooks lurking about. More than one keeper reported the presence of two phantom figures in the lantern room, and unexplained knocks and the ringing of a phantom bell were often heard in the middle of the night. Many lighthouse personnel swore that on calm, sunny days, if one looked at the reflection of the tower in the water, the images of the two drowned keepers would appear in the doorway. Minot’s Light was automated in 1977, but this did not end the paranormal activity. Boaters hurrying to shore as the skies darkened and the seas became increasingly rough sometimes reported seeing what appeared to be a man clinging to a ladder on the side of the weather-beaten old lighthouse. He was screaming, they said, but his words were indecipherable. At least they were until a Portuguese fisherman witnessed the phenomenon and declared the man was calling for help in his native tongue. Joseph Antoine, you see, was a native of Portugal. Gurnet Point Light. This 34-foot lighthouse (aka Plymouth Light), pictured above, stands in Plymouth Bay. The first tower was built in 1769, and replaced in 1803, 1843 and 1924. John and Hannah Thomas, who owned the land on which the lighthouse was constructed, became its first keepers. After her husband was killed in the Revolutionary War, Hannah became the first female lighthouse keeper in America. From all reports, Hannah was an effective and very dedicated member of the US Lighthouse Service. In fact, she loved the lighthouse so much, she never left. In 1994, Bob and Sandra Shanklins of Fort Walton, Beach, Fla., who have photographed lighthouses all over the world, spent the night in the keeper’s house near the tower. A little after midnight, Bob awakened to see the upper portion of a woman’s body floating near the bed. He said the apparition had long, dark, shoulder-length hair and “very sad eyes.” While there is no means of ascertaining with any degree of certainty the identify of the Gurnet Point ghost, Shanklins maintains he had a “feeling” he was seeing the spirit of Hannah Thomas. Bird Island Lighthouse. Built in 1819, just off Marion, Mass., in Buzzard’s Bay, the little 29-foot Bird Island Lighthouse was recently rescued and renovated by the Bird Island Light Preservation Society. 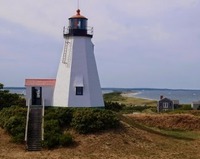 Around 1830, a former pirate by the name of Billy Moore, was hired as keeper of Bird Island Light and he and his wife, who had a fondness for tobacco, took up residence in the keeper’s quarters. The citizens of Marion welcomed the couple and made frequent visits to the island, always bringing a little tobacco for Mrs. Moore. Her husband attempted to discourage this practice, alleging his wife had a “consumptive cough.” Several citizens noticed that Mrs. Moore often sported black eyes and other bruises and feeling sorry for the lady, continued to supply her with tobacco. Then one frigid February morning in 1832, the distress flag was flying at Bird Island Lighthouse and, upon arrival, townsfolk discovered the lifeless body of Mrs. Moore. Her husband claimed she had “succumbed from nicotine.” Somehow, the wily old ex-pirate convinced the group of concerned citizens that his wife had been suffering from “contagious tuberculous” and they wasted no time digging a grave in the soft sand of the beach – the only ground around that wasn’t frozen – and hastily burying the lady. Afterward, people got to talking about the bruised, battered body of the keeper’s wife and the sheriff decided an investigation was in order. By that time, though, Billy Moore had fled, never to be heard of again. The next keeper of Bird Island Light didn’t stay long. He quit, declaring he and his family were unable to contend with the ghost of an old woman who kept knocking on the door in the middle of the night. Subsequent keepers had similar experiences and one even claimed his children were repeatedly frightened by the spirit of a “stoop-shouldered old lady” with one arm extended as though reaching out for something. Baker’s Island Light. 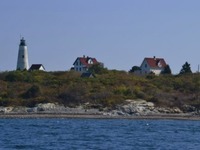 Baker’s Island is one of a group of 15 islands called the Miseries, lying some five miles out from Salem Harbor. Consisting of 55 acres and dotted with several rambling old summer houses with wide porches and high ceilings, the island serves as a seasonal retreat for a select group of New Englanders – primarily from the Salem area. In addition to the houses, there is also a general store, pump house and, of course, the Baker’s Island Lighthouse (above). Built in 1859, the 59-foot light was originally one of a pair of lighthouses. Its shorter mate was extinguished and dismantled in 1926. No one has been able to identify the haunting at Baker’s Island Light, but many have experienced it. The specter is something of a pest who delights in interrupting the sleep of keepers and caretakers by activating the fog horn. Andy Jerome, who served as caretaker from 1983 to 1987 recalls the fog horn sounding “for no reason on crystal clear nights.” He reported the problem to the Coast Guard on numerous occasions, but when repairmen came out to check the device, they could never find anything wrong. According to Jerome, the fog horn never “acted up” in the daytime, only in the dead of the night. The horn-blowing poltergeist isn’t the only phantom on Baker’s Island. Several of the old summer cottages are said to be haunted, too. In researching the phantoms of Baker’s Island, Salem author Bob Cahill interviewed various caretakers and summer residents who had witnessed supernatural activity. The Chase Cottage, the largest structure on the island, has been haunted for years. Family members have reportedly seen filmy shapes darting through the gloomy halls, and at least one individual claims to have encountered an evil presence in the house. The majority of the paranormal activity on Baker’s Island takes place during the winter months when the island is deserted. Caretakers have heard what sounds like a party emanating from the Chase Cottage, workmen in the Wells Cottage have been attacked by a “kissing ghost,” and lights are sometimes seen in the general store and Nicholson house when both are closed for the season. Sources: Lighthouse Mysteries of the North Atlantic by Robert Ellis Cahill, John Ford Interview (1999), U.S. Coast Guard Files, Lighthouses & Keepers by Dennis L. Noble and The Salem Evening News. The one on Baker's Island seems to be the most haunted, but it sounds like it's a private island, so probably not many people get to visit it. I have some friends in Port Orange who just returned from the Boston area. While they were there, they went on a boat tour to Baker's Island and the guide told them the island was said to be haunted. The island had an "atmosphere," the said, and that it would be a very lonely and spooky place during the wintertime.